To analyse a RF prediction model and determine the accuracy, a itterative process called model tuning has to be deployed. In this process a number of steps have to be followed and at the end you have tuned the model and you know the accuracy of the model. 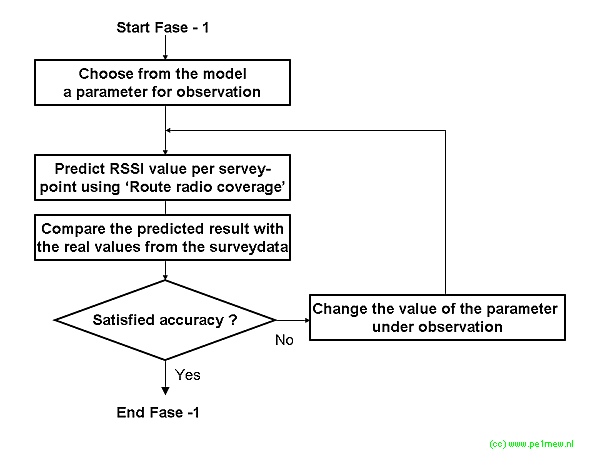 This process is applicable all RF propagation models an not only for the model used in Radio Mobile. The full process is described in a flowchart and references are added to some other topics on this site. Please be aware that this description is only a global one. In professional model tuning more topics need attention and quality and accuracy are very important. The model tuning starts with collecting survey data. To be 100% accurate, the survey data collection is started by selecting the area over wich you want to tune your model for. The first holds the route file of the survey and contains all positions on wich measurements are performed during the survey. This file must be in the .plt format. The secon file holds both locations and values from the survey. This file is used later for comparing calculated results with. Now we set our targets on how accurate we want to have our model. This is the end of the preparation fase. In the following step one fase out of many is described. This step must be repeated until a satisfying result is reached. First we have to decide on wich parameter will be tuned. Now we perform a 'Radio route coverage' where the .plt route file from the survey is used. In this step the result is evaluated. If the result does not satisfy: Based on the observations it is decided to increase of decrease the in step 1 selected value. If the result satisfies, you might decide to select the next variable in the model or finish modeltuning.